straightforward and informative in terms of the message they are presenting and the target audience they are directed toward. Common types of direct headlines include those offering a specific benefit, making a promise, or announcing a reason the reader should be interested in the product or service. Indirect headlines are not straightforward about identifying the product or service or getting to the point. But they are often more effective at attracting readers' attention and interest because they provoke curiosity and lure readers into the body copy to learn an answer or get an explanation. Techniques for writing indirect headlines include using questions, provocations, how-to statements, and challenges. Indirect headlines rely on their ability to generate curiosity or intrigue so as to motivate readers to become involved with the ad and read the body copy to find out the point of the message. This can be risky if the headline is not provocative enough to get the readers' interest. Advertisers deal with this problem by using a visual appeal that helps attract attention and offers another reason for reading more of the message. For example, the ad for the Lexus GS sports sedan shown in Exhibit 9-22 uses a question as the headline that invites consumers to read the copy to learn more about the features of the car and decide how to categorize it. The visual portion of the ad supports the positioning theme by showing the GS 430 being driven on a windy road. Subheads While many ads have only one headline, it is also common to see print ads containing the main head and one or more secondary heads, or subheads. Subheads are usually smaller than the main headline but larger than the body copy. They may appear above or below the main headline or within the body copy. 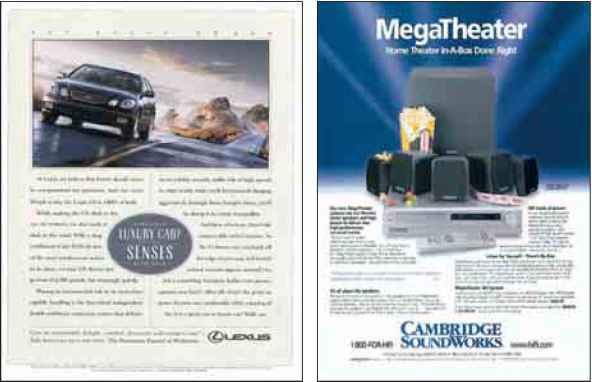 The Cambridge SoundWorks ad shown in Exhibit 9-23 uses subheads within the body copy. Subheads are often used to enhance the readability of the message by breaking up large amounts of body copy and highlighting key sales points. Their content reinforces the headline and advertising slogan or theme. Body Copy The main text portion of a print ad is referred to as the body copy (or sometimes just copy). While the body copy is usually the heart of the advertising message, getting the target audience to read it is often difficult. The copywriter faces a dilemma: The body copy must be long enough to communicate the advertiser's message yet short enough to hold readers' interest. Body copy content often flows from the points made in the headline or various subheads, but the specific content depends on the type of advertising appeal and/or execution style being used. For example, straight-sell copy that presents relevant information, product features and benefits, or competitive advantages is often used with the various types of rational appeals discussed earlier in the chapter. Emotional appeals often use narrative copy that tells a story or provides an interesting account of a problem or situation involving the product. Advertising body copy can be written to go along with various types of creative appeals and executions—comparisons, price appeals, demonstrations, humor, dramatizations, and the like. Copywriters choose a copy style that is appropriate for the type of appeal being used and effective for executing the creative strategy and communicating the advertiser's message to the target audience. Visual Elements The third major component of a print ad is the visual element. The illustration is often a dominant part of a print ad and plays an important role in determining its effectiveness. The visual portion of an ad must attract attention, communicate an idea or image, and work in a synergistic fashion with the headline and body copy to produce an effective message. In some print ads, the visual portion of the ad is essentially the message and thus must convey a strong and meaningful image. 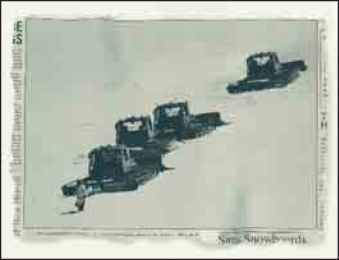 For example, the award-winning ad for Sims Snowboards shown in Exhibit 9-24 uses a powerful visual image. In a scene reminiscent of the protestor blocking military vehicles in Beijing's Tiananmen Square during the 1989 student uprising, a snowboarder stands in the path of snow-grooming machines (which pack the snow, to the distress of snowboarders). The single line of copy, "In a courageous act of solidarity, a lone snow-boarder stands up for freedom," reinforces the message presented by the visual image. Many decisions have to be made regarding the visual portion of the ad: what identification marks should be included (brand name, company or trade name, trademarks, logos); whether to use photos or hand-drawn or painted illustrations; what colors to use (or even perhaps black and white or just a splash of color); and what the focus of the visual should be. 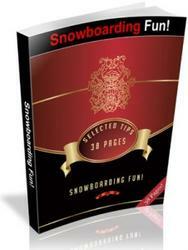 If you are thinking about getting started with snow boarding then it really does not have to be as difficult as you are probably imagining. For a start, you can be sure that whatever you are planning to do you can be sure that as soon as you hit the slopes you will almost certainly enjoy yourself.